Up until now I never fully grasped the concept of the ‘travel bug’. It just didn’t really make sense to me. However, after a recent family trip to two of the most amazing places on earth, all of that changed. Not only do I now have a new found understanding of the concept, but it appears I have in fact caught that very same bug. There is just one little problem though, this new found travel bug of mine; it appears to be stuck. The dreams are there and the plans are in motion, but I don’t think the financial side of things has been taken into account just yet. Someday though, when this little bug gets all of her finances in order and finally masters the art of saving, I have a feeling that she’s going to be in for the trip of a lifetime. After all, her list appears to be growing longer and longer by the day. 1. Frolick on the beaches of Hawaii whilst eating a mango and coconut shaved ice; again. 2. Swim in the pool at the Mandalay Bay Casino, Las Vegas. 3. Fill an entire trolley full of food at The WholeFoods Market, Las vegas. 4. Line dance in Alabama. 5. Spend a day admiring the Country Music Hall of Fame in Nashville, Tennessee. 6. Watch a real Major League Baseball game with my boy, preferably the Orioles vs Phillies in Baltimore, Maryland. Then on the way home from the game, visit the hotel that I imagined visiting every day for 6 months out of the past two years. 7. Shop for an entire day at any Walmart store in America. 9. Ride the Ferris Wheel at the Los Angeles County Fair. 18. Spend a day shopping at the Harrod’s store in London, United Kingdom – Just so I can come home with one of their fancy little bags. Ps. That last little travel dream of mine, if it truly is as good as I imagine it to be then please don’t be surprised if I move there someday. 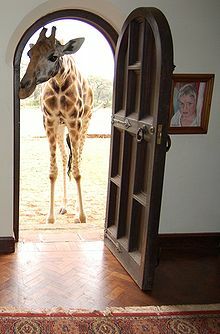 After all, what girl doesn’t want to wake up to Giraffe kisses every morning?